Hello! Today for Lawn Fawn inspiration week we are featuring the new Perfectly Plaid paper collection. I told Kelly I thought she should do a plaid collection and boy did they not disappoint! I love every plaid in the collection and that is not always true for all paper collections. I think this one is going to be a favorite. I really like how all the patterns come in both 45 degrees and 90 degree orientation. I used a piece of the Nancy 12 x 12 paper for this card with a little bit of Nicole for the fold up in the corner. I stamped out Bigfoot from Lovable Legends in Walnut ink and colored him with colored pencils. I used the matching dies to cut him out so he could peek out from the corner. I stamped the sentiment with Soot ink and the footprints with Doe. 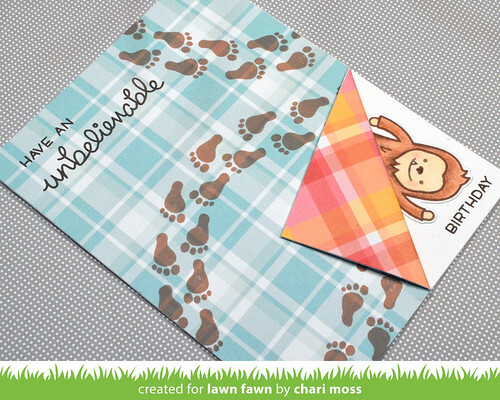 Be sure to check out the Lawn Fawn blog today for more projects with the Perfect Plaid collection. Oh SO CUTE! Such a funny card! Great work! I love this, so fun, so cute!